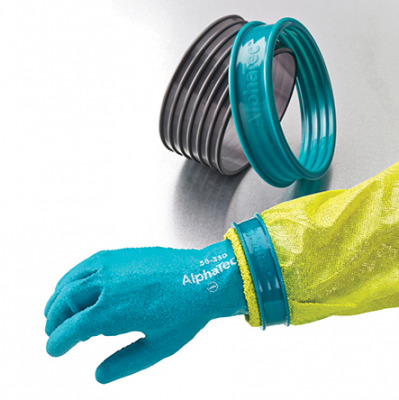 The Ansell AlphaTec Glove Connector 070 is designed with a ribbed cone and collar for securing into place to create a liquid-tight seal between the glove and the cuff. It works with a wide range of chemical glove thicknesses, reducing the risk of water, liquids, and chemicals entering the glove or travelling up the sleeve. Please note that the AlphaTec Glove Connector is sold as a single item. This allows you the convenience of purchasing as few or as many as your workplace requires. The Ansell AlphaTec Glove Connector 070 has been tested in accordance with ISO 17491-3:2008: Determination of resistance to penetration by a jet of liquid (jet test). More information about which gloves and coveralls were used during testing can be found in the PDF at the bottom of the page. No matter how liquid-resistant your gloves are, if you've not secured the area between your glove cuff and your sleeve then there's every chance that liquids and chemicals may still come into contact with your skin. The Ansell Glove Connector secures into place to create a liquid-tight seal between the cuff and the glove, reducing the risk of irritation or injury to the skin as a result of contact with liquids. Watch the video below to see the AlphaTec Glove Connector up close. It also demonstrates how to secure the attachment into place. Please see the PDF below for information about how to secure the Glove Connector 070 into place.